Nigella sativa, or black cumin seed, as it is more commonly known, is the latest natural substance to receive the Cibdol treatment. 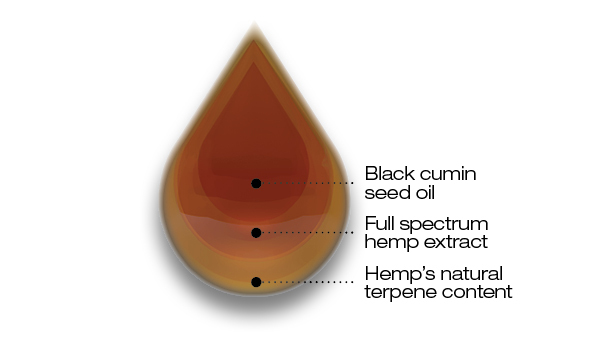 Utilising the same sophisticated extraction techniques as for our golden-grade CBD oil, our experts have retained the critical components of this versatile plant. Free from inactive plant material, the black seed oil has been subjected to the same high standards of filtration you have come to expect from our products. Simple to administer, our 3% CBD Black Cumin Seed Oil is easy to incorporate into your daily routine. Moreover, black cumin seed's natural qualities won’t disturb or upset the balance of terpenes and compounds that make our full-spectrum CBD oil market-leading. Instead, the two substances complement each other, providing a well-rounded therapeutic experience. Free from artificial preservatives, added chemicals, and additives, our 3% Black Cumin Seed Oil is ideal for anyone interested in the therapeutic potential of the Nigella sativa plant. Our Black Cumin Seed Oil is certified as Halal, making it a perfect choice for everyone. Buy yours today. We produce of one of the purest and finest quality CBD oils available in Europe. Cibdol CBD oil 2.5% is clean and pure and made from 100% naturally grown fiber hemp. Cibdol CBD oil is the perfect CBD product for health-conscious users who don’t want the psychedelic effect of cannabis. We pride ourselves on producing the finest quality CBD oil, and out 2.5% CBD oil is no exception. With a new formula and improved filtration process, Cibdol CBD oil is now even easier to use and to dose. This new range of 2.5% CBD oils presents health-conscious users with even further flexibility when it comes to dosing our CBD. Cibdol CBD softgel capsules will revolutionise your daily CBD regimen. Featuring the same potent formula as our renowned, golden CBD oils, this new product encapsulates powerful cannabinoids within a tasteless, easy-to-swallow gel that can travel on-the-go and makes dosing easier than ever. Each box consists of 60 capsules with 6,4mg of CBD per capsule, containing our 4% unadulterated CBD.